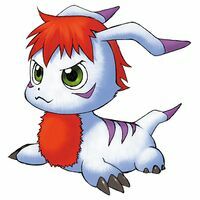 Due to the fact that its lovable personality has grown even more, expressing its emotions more vividly with its distinctive red fur, it is getting many enthusiastic Gomamon fans. 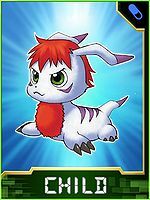 However, it is difficult to raise for enjoyment purposes, exhibits astonishing power despite its small body, has started moving quickly even on land, and as expected, it did not lose its abilities as a "Combat Species" Digimon. It very rarely acts alongside the enormous Daipenmon, and personally seems to think of Daipenmon as its follower. 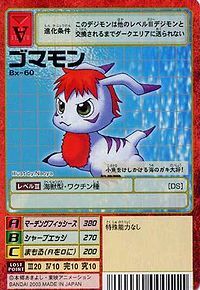 Although its seldom seen "Goma Milk Death" appears to be a technique that Gomamon specializes in, it is actually a powerful Special Move that Daipenmon unleashes. マーチングフィッシーズ Māchingu Fisshīzu Summons a school of colorful flying fish. シャープエッジ Shāpu Ejji Jumps up and slices at the enemy repeatedly while in mid-air. Goma Milk Death  Sesame Milk Death ゴマミルクデス Goma Miruku Desu Unleashes the power of its friend Daipenmon. 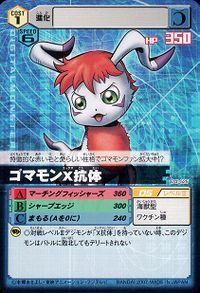 Gomamon X-Antibody is a Non Playable Character. It can also be obtained as a collectible card. This big bully of the sea picks on small fishes! Its characteristic red hair and lovable personality are creating more and more Gomamon fans!? This page was last modified on 22 April 2019, at 21:57.